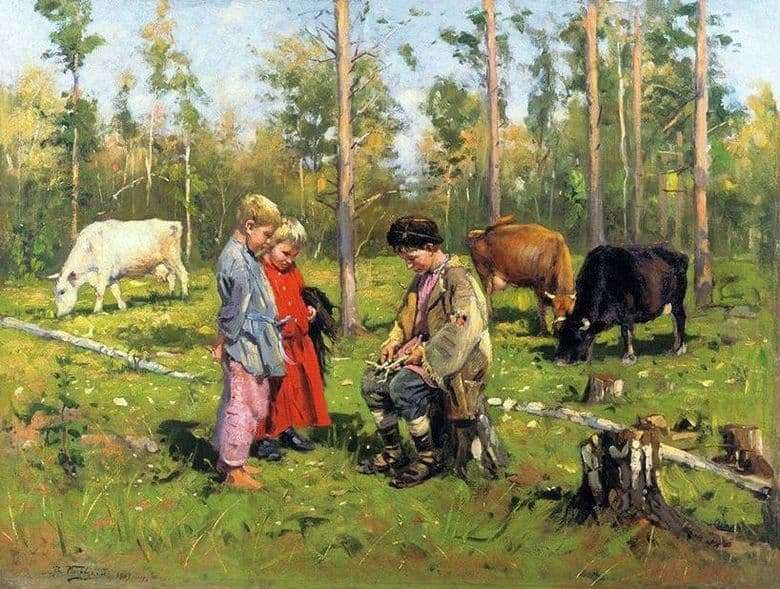 The painting “Shepherd” – a vivid example of Russian realistic painting. The work is obviously textbook in nature and seeks to show the life of the simple Russian people as accurately and clearly as possible. So deep into the world of childhood artist helps the birth of their own sons. In the center of the plot are the village cowherd boys. On the meadow, gladly pinching the juicy grass of a cow. It’s a nice day, everything is flooded with sunshine. The boy sits on a stump and makes a slingshot, the rest of the children closely watch his work, completely forgetting about grazing animals. They are dressed in simple, loose clothing, in some places there are gaps, frayed edges. It seems that children wear clothes for their elders, however, this does not cause pity. Their faces express genuine interest and concentration, which are inherent only to young researchers for an interesting occupation. The canvas is written in natural strokes, the contours are purposefully softened. The forest that makes up the background is delicately blurred in order not to distract attention from the main characters. Coloring canvas cheerful and contrasting. Bright green grass, clear blue sky, red dress of the girl – the artist seeks to show the special fullness of life in the village, the ability to notice and cherish simple joys. Appeal to daily activities is Makovsky’s favorite trick, which helps the viewer to understand and get closer to the simple Russian person. The composition of the work is very harmonious and relaxed. There are no small distracting details, inappropriate color palette, imagination and sensation of staging. There is no clear geometric order that would be inappropriate for such a natural household scene. The picture was immediate and sincere, like the very soul of a child, immaculate and filled with light.